Netbeans is an opensource IDE from Sun and is gaining a lot of developer support. I've certainly abandoned Eclipse and switched, as the java facilities are just as good (for me) and importantly Netbeans offers a wonderful GUI form designer plus UML facilities, which Eclipse doesn't come bundled with for free. 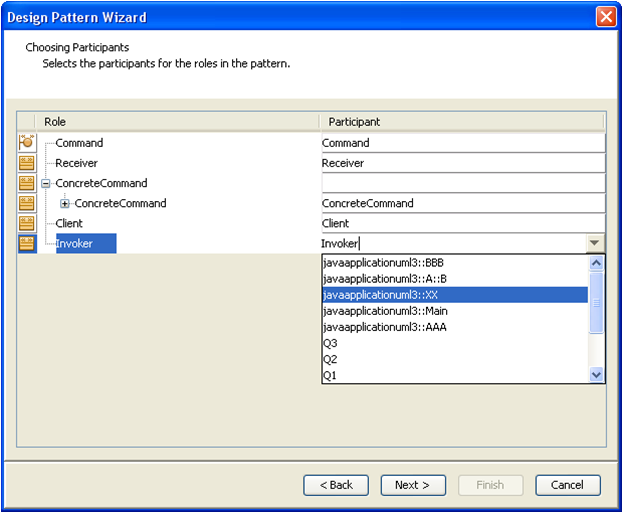 Let's take a look at the UML and design pattern support in Netbeans and investigate Netbean's cool ability to build "custom" design patterns - visually. The UML diagramming in quite good. You drag out objects from a palette or use the "hover palette" next to a class to drag out links to either existing or new classes. This gui metaphor is nice to use and saves you constantly returning to a palette on the side of the screen in order to add objects and connections. Use the "hover palette" next to a class to drag out links to either existing or new classes. Any UML you do in Netbeans requires you to create a special "UML project". This contains a model of your classes and methods etc. as objects. 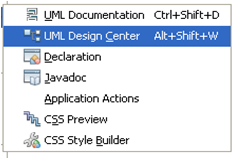 The UML view is driven off the model. 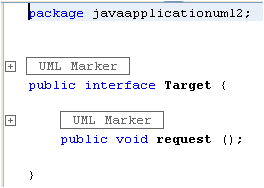 UML markers in the code help code sync e.g. unless you know what you are doing! which actually comprise comments with a unique guid e.g. UML generates classes, interfaces, enums, methods and attributes No substantive code is generated Attributes can be one to many etc. When you click on a association line, select properties and select multiplicity, you get a choice of implementation e.g. Note that you must specify the association as “navigable” to get an "arrow" on your line and to get any code generated for that association. And in the above code you don't get your X.Add(z) method you instead get some strange setter which accepts an entire arraylist - as if anyone does that. You can build code generation templates to generate more substantial code. 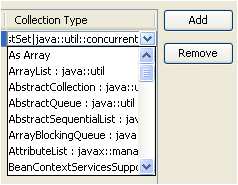 Netbeans uses this templating system throughout itself e.g. the default java class stub you get when you create a new java class is a freemarker template. To generate code using freemarker via UML you need to mark your UML classes with stereotypes and associate those stereotypes with a template. Unfortunately the whole code generation aspect is currently poorly documented and there is no API published except a code class interface that one is meant to decipher. The one tutorial uses a 441 line freemarker template to generate a couple of lines of code !! And the Sun developers in this area claim there are no resources to provide any more documentation. View the forum discussion here. Invoking the design pattern wizard. Mapping design pattern roles to existing or new classes. Before and after applying the Singleton design pattern. return null;   // but sorely needs functional code here...instead of returning null ! return 0;                       // huh? Shouldn't this return this.singletonData ? It seems that when generating sub methods, if the method returns a value, there is some default code generation which returns null or 0 or something that will allow the generated code to compile. However this might confuse newcomers who perhaps see this generate code as properly functinal in some way. Let me repeat, there is no code generation of body code from design patterns except for the default return values that you normally get with UML code generation. Yes you can generate code from UML but that requires that you write FreeMarker templates and associate these templates with stereotypes (just set the stereotype property of a uml class or method). The design patterns don't apply these stereotypes, nor do they provide any freemarker code generation templates. The code generation that exists is buggy anyway esp. with multiplicity of attributes. Here you can view the existing patterns in the patterns "design centre". It is very easy to create a folder and add your own patterns. The UML Design Centre, where you can add your own patterns. 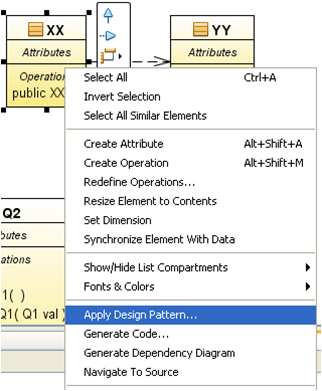 The UML palette relating to design patterns. When building a design pattern, instead of adding a class you add a "class role" object from this special design pattern palette. 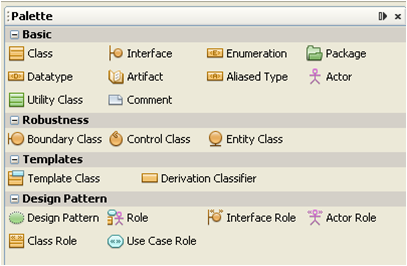 The role objects are placeholders for a new or existing classes (or use cases or interfaces etc. ), which you can fill in using combo drop downs etc. when the pattern is finally applied via the design pattern wizard. You link all the roles together with a collaboration object and you are done. 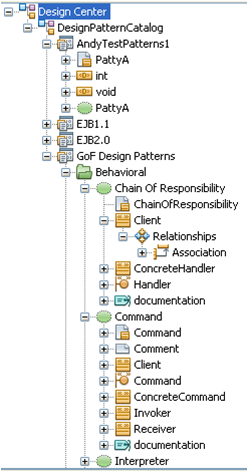 The collaboration object lets you name your pattern and becomes the anchor for all the roles. Its a pity you don't get collaboration object in regular diagramming in order to document your patterns once they have been applied. 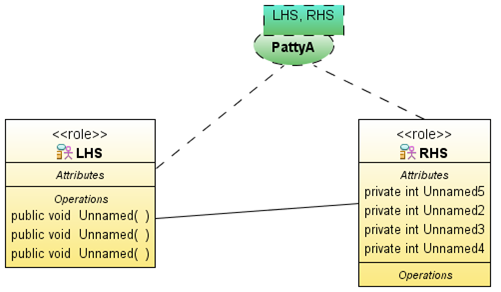 You can instead use notes with multiple links (though this doesn't let you label the links) or make do with tagging your UML classes with stereotypes, indicating the roles e.g. Adapter, Adaptee, Client etc. An example custom design pattern! Applying my new pattern to my workspace. Be careful when using design pattern "automation". The particular pattern implementation may not suit you situation. For example "Adapter" is a object adapter not a class adapter. You need to understand patterns anyway to use these tools. Newly generated code java files don't always appear in the project so you have to close and reopen the target project or wait till some emergency timer refresh kicks in. Code generation concepts "Add Merge Markers to Existing Source Elements" and "Generate Markers for Source File Merging" too complex, IMO.